In a world where technology advances exponentially and the pace of our everyday lives leaves us breathless, 10 students of Holland College’s Culinary Institute of Canada are stepping away from their laptops and cell phones to stop and smell the roses…and the tomatoes, cucumbers, radishes, and herbs! Culinary students Chris (in the foreground), Amy Fox, and Jared with Jack in the garden at the TCC. You can see the Three Sisters formation in the background, and behind the trees, you can see the harbour. 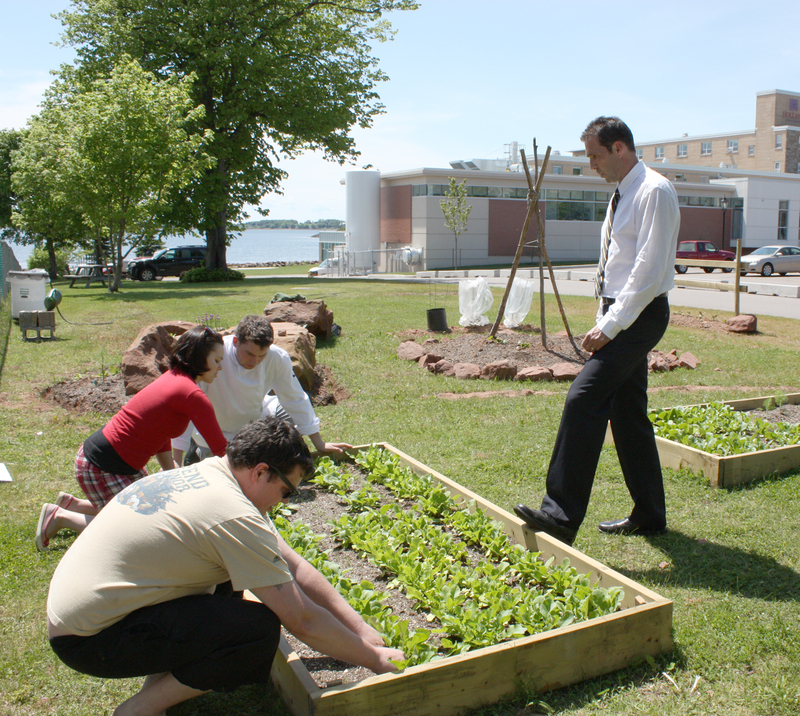 Under the guidance of Culinary Arts instructor Jack Wheeler, the students have taken over a strip of land beside the parking lot at the Tourism and Culinary Centre on the Charlottetown waterfront and planted an organic garden. Jack wanted to integrate the notion of using local food into the curriculum and encourage the students to think more about the ingredients they were using. The fruits of their labours will be used in the kitchens at the CIC, adding a little extra cachet to the already impressive meals the students prepare for the Lucy Maud Dining Room and the Montgomery Cafeteria. In addition to tomatoes, cucumbers, radishes and a variety of herbs, the garden features beans, squash and companion plants that will repel pests and attract pollinators. No stranger to gardening, Jack showed the students how to build a structure called Three Sisters, a traditional Native American structure that usually includes corn, beans and squash. The corn stalks form natural poles for the bean vines, which stabilize the corn plants and enrich the soil with nitrogen, while the squash form mulch to discourage pests and weeds. In this garden, there are three tall wooden poles in place of the corn. Working on the garden gives the students time to reflect on the way they prepare food. Jack says that although some of the garden is trial and error, it has also given the students an opportunity to discuss their ideas about sustainable food systems and ways to integrate this into their work. It’s as though the physical act of digging and weeding and planting gives students the opportunity to focus on the concept of food on an entirely different level. Jared Ritz, a first year Culinary Arts student, is passionate about the project. 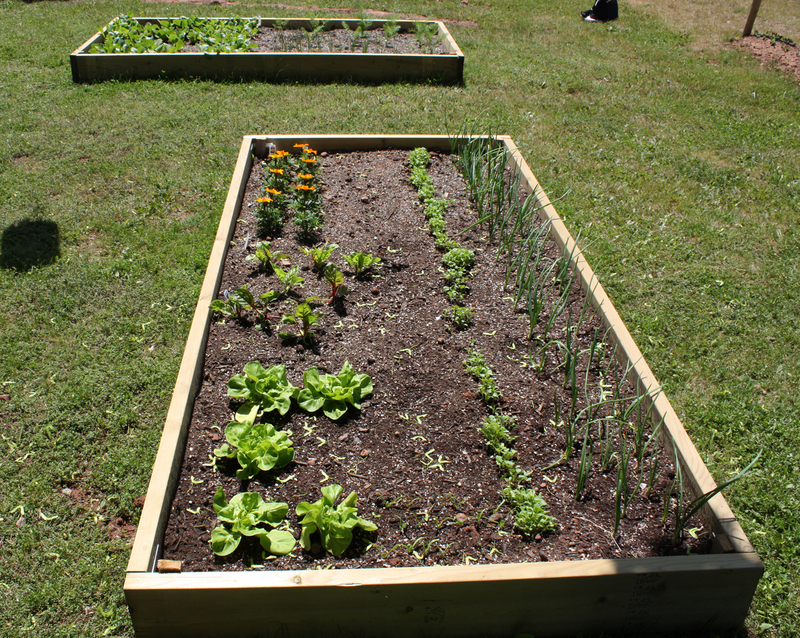 His high school in Ontario had a garden, and he’s applying the knowledge he learned there. “Every school should have a garden,” he insists. He shows me the herb patch, which has been planted amidst a group of large rocks. “The heat from the rocks will help keep the plants warm, it’s like it has its own micro-climate,” he says. 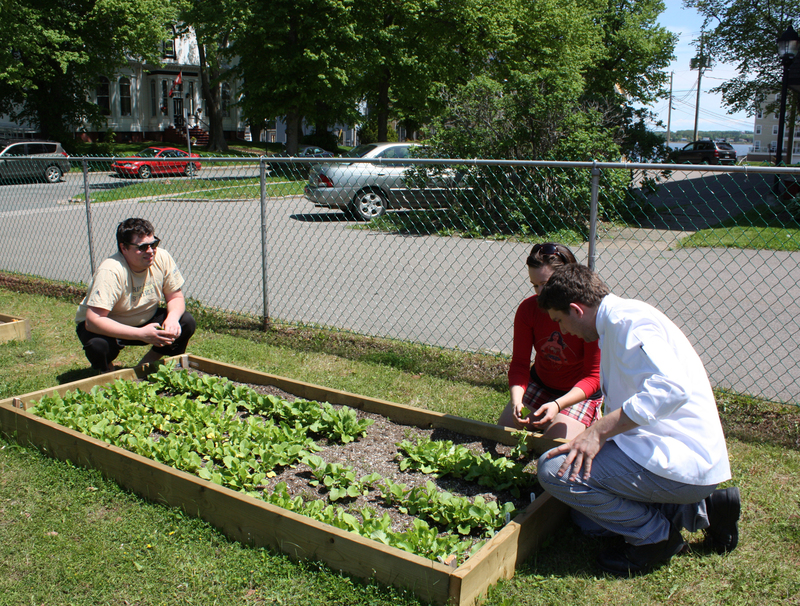 Chris Sallie, a second year Culinary Arts student, joins us in the garden to do some weeding. He’s enjoying the project, and believes that using these home-grown ingredients will make students think more carefully about what they are doing. As Jared gathers some radish leaves to take back to the kitchen, Chris points out an interesting offshoot of the garden project. “You respect your food a lot more, and you’re less likely to let it go to waste or do something silly with it if you’ve grown it yourself,” he says. Marigolds help keep pests away from the vegetables. There’s a seniors’ home next to the Tourism and Culinary Centre. In the past, there’s been little interaction between the residents of Park West Lodge and students at the TCC. That’s changing. Over the last few weeks, seniors are coming to sit in the shade at a picnic table next to the garden, watching the students as they work. Jack sees the potential for the garden to help students connect with the community. Many of the plants in the garden have been donated, and he’s hoping that as people in the area become more aware of the work the students are doing, they will receive more donations. “We would like to have some fruit trees and more ornamental plants as well. I see this as a long term project. This is only a starting point,” Jack tells me. This living classroom will continue to provide the students with lessons well into the fall. When the tomato crop is ready, for example, they will be harvesting the (potentially) 300lb crop and learning how to preserve it. There is something fundamental to our well-being about connecting with nature. For many of us, adapting to technology and integrating it into our lives and workplaces have stretched the strands of that connection to breaking point. These students belong to the generation of digital natives, born into a world of Internet and e-mail, of MP3s and downloadable apps; but it’s also a world where people are becoming increasingly concerned about the source of their food and the sustainability of supplies. Hopefully these young people will be able to maintain and renew their relationship with the planet…even if it is one plant at a time! I plan to visit the garden over the next few months, and I’ll post new pictures as the summer progresses. Michael O’Grady, Vice President responsible for international development at Holland College, and Lornie Hughes, a manager in the International Office, visited Queens College School in Nassau. Queens College is the oldest private school in the Bahamas and offers preschool through Grade 12. Holland College and Queens College have been working together to provide post-secondary and internship opportunities for Queens College students. While in the area, they visited Carla Albury and Denise Newton. Carla is first-year Early Childhood Care and Education student who is completing a six-week internship at the primary school in Queens College. Denise studied in the Tourism and Travel Management program in 2009 as a part of an exchange agreement with the College of The Bahamas, and is now teaching physical education in the Queens College primary school. Mike and Lornie also visited Jordan Prince Williams High School, where Donathan Moss, a current second year Tourism and Travel Management student, and recent graduate from the Business Management program, Josette Demeritte, are alumni. The students and staff were very welcoming, and even had their Holland College advertisement hanging over the front door! Donathan showed the Mike and Lornie the basketball court he played on during high school. Holland College’s ties with the Bahamas continue to strengthen, with students coming from there to take a wide variety of programs at the college, from training at The Culinary Institute of Canada to a cadet program at the college’s Marine Training Centre in Summerside, and everything in between!